This Session Initiation Protocol (SIP) compatible VoIP phone from 3Com is probably not targeted toward a mainstream audience. Sure, SIP is the de-facto open source VoIP protocol used in VoIP projects like Asterisk, but how many "regular people" do you know are willing to go and set up an Asterisk system in their house? Sure, I've done it, but I'm no regular person—so the answer to that question is probably zero. 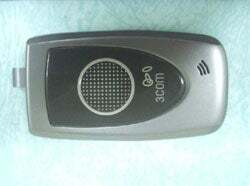 Nevertheless, the 802.11b/g compatible 3Com 3108 looks like a clamshell cellphone but works over WiFi so you can talk all your buddies like you were using an actual cellphone. It's also capable of being used on VoIP providers like Gizmo Project, which at least gives some functionality to people who aren't avid VoIP Do-It-Yourselfers.